Guillaume Le Dréau in performance. Guillaume Le Dréau is one of the most multi-faceted musicians I know. 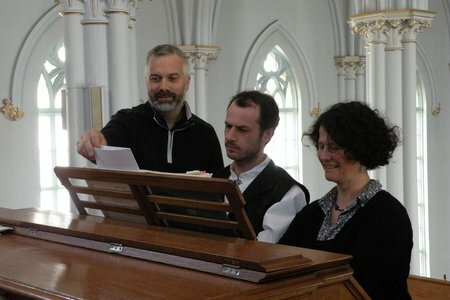 A keyboard artist, he is currently the organist at Rennes Cathedral in France — but this position represents only one aspect of his many musical activities. Not only does he play the organ and piano, he is a composer, an arranger, a teacher and a researcher. I became acquainted with Mr. 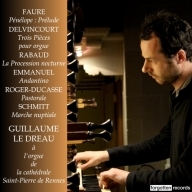 Le Dréau through his 2016 recording of French organ works made at Rennes Cathedral and released several months ago by Forgotten Records. 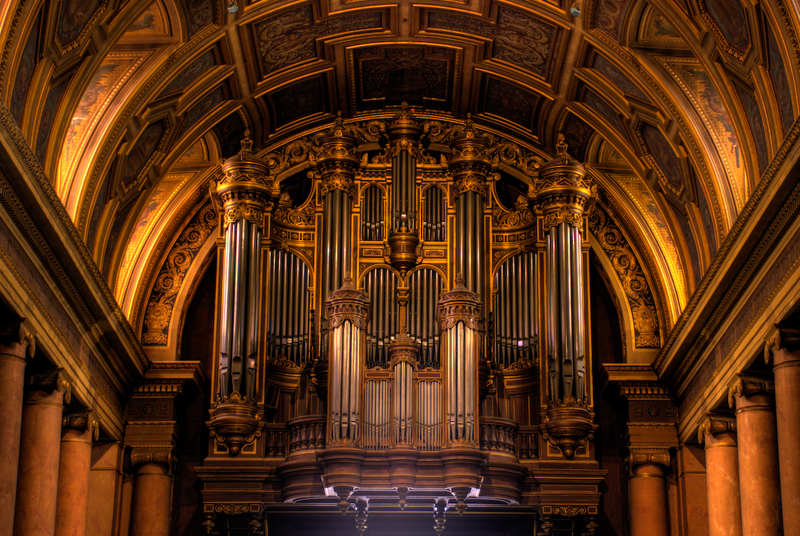 It is a fascinating program of original organ pieces by Claude Delvincourt, Maurice Emmanuel, Jean Roger-Ducasse and Florent Schmitt, along with two orchestral works by Gabriel Fauré and Henri Rabaud that Le Dréau has arranged for organ. 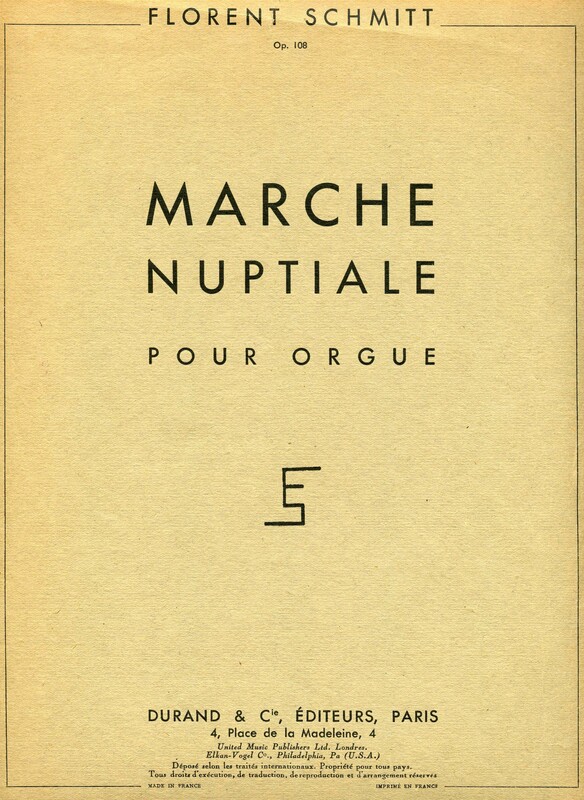 The score to Florent Schmitt’s Marche nuptiale, published by Durand. As it turns out, this bit of ironic wit is but one of many instances where Florent Schmitt has weighed in with clever or satirical commentary. It is a window into a lesser-known aspect of Schmitt’s life as a musician – because in addition to having a composing career that spanned more than seven decades, he was a respected and prolific music critic in Paris for a period stretching nearly 30 years. As well, when we realize that it was Schmitt himself who said this about his own work as a music critic: «Le critique qui a peur de faire de la peine ne peut pas critiquer» (“The critic who is afraid of pain cannot critique”), it makes us even more curious to learn more about this particular aspect of the composer’s life in music. Thankfully for us, as part of his music research activities Mr. Le Dréau has spent much time investigating Schmitt’s voluminous writings that were published in four major Parisian newspapers between the years 1912 and 1939. Indeed, in their musical insights (in addition to their sheer volume), the writings of Florent Schmitt rival the critical work of Virgil Thomson and Nicolas Slonimsky. And just as the newspaper columns of those two illustrious musicians have now been published in annotated editions, Guillaume Le Dréau has made it a goal to accomplish the same with Florent Schmitt’s oeuvre. He has been at the task for the past several years, and the hope is that his work will be completed and a publisher found to bring out what will likely be two large volumes of printed material. PLN: How did you first become acquainted with the music of Florent Schmitt? Were you exposed to his music during your studies at the conservatory, or in some other way? GLD: My introduction to Florent Schmitt began in the class of Alain Louvier [at the Paris Conservatoire] who is a noted composer, orchestrator and connoisseur of 20th century French music. He exposed us students to many French musical rarities during those class sessions – works by Roussel, Cras, Aubert, Milhaud, Jolivet and others. One day I heard a short excerpt from Florent Schmitt’s piano set Ombres, and Alain Louvier spoke to us about Schmitt, noting in particular his outstanding talent for orchestration. This piqued my curiosity, and from there I discovered Schmitt’s La Tragédie de Salomé. I had been seeking out a French work to analyze for my dissertation, and this piece struck me like a thunderbolt. Through recordings and music scores, I endeavored to discover as much as I could about Schmitt, a composer who unfortunately still suffers a kind of purgatory – at least in France. PLN: What compositions by Schmitt did you come to know first? As a keyboard artist, which ones have you performed? GLD: It began with La Tragédie and the Psaume XLVII, but also pieces like Rêves – a masterpiece of harmony and orchestration. 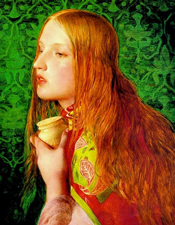 There was also the magical – and mischievous – Petit elfe and the gleaming Oriane, Antoine et Cléopaâtre and Salammbó. And this doesn’t even count the chamber music (the Piano Quintet, Suite en rocaille, plus the Sonatine en Trio for flute, clarinet and piano). Florent Schmitt published his own arrangement of La Tragédie de Salomé for solo piano in 1913, one year after completing the revised orchestral score. Also, I performed some Schmitt songs during my conservatory coursework and also played La Tragédie in Schmitt’s own version for piano, as well as the composer’s piano tributes to Debussy and Dukas. Last but not least, I studied Ombres – definitely one of the greatest French piano masterpieces of the first half of the 20th century. As an organist, obviously I’ve played the only two solo organ works composed by Schmitt: an early prelude [Prière] for organ-harmonium published by Joubert, and the much-later Marche nuptiale [Op. 108]. But this isn’t everything that I would like to study and perform, considering the richness of Schmitt’s musical catalogue. For example, I hope to perform the Mass [Op. 138] and the Liturgies joyeuses [Op. 116], among other works. PLN: One lesser-known aspect of Schmitt’s musical career was his work as a music critic and a writer on music. How did you become familiar with this facet of his activities? Three biographies of Florent Schmitt: Hucher, Ferroud, Lorent. 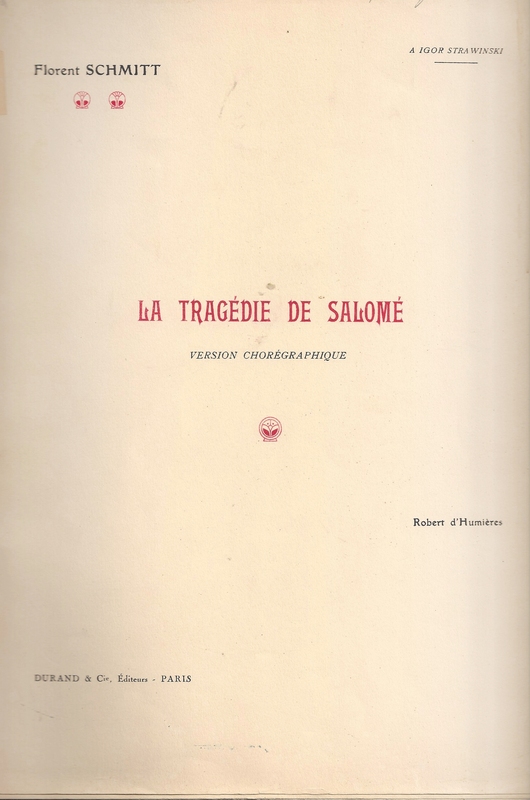 GLD: During the preparation of my thesis on La Tragédie de Salomé in 2009 and 2010, I consulted important documents about Florent Schmitt – in particular biographies of the composer written by Pierre-Octave Ferroud, Yves Hucher and Catherine Lorent as well as other writings by authors such as Ladislas Rohozinski, Jean Roy, Octave Séré, Julien Tiersot and Emile Vuillermoz. Within these sources I found references to Schmitt’s writings as a music critic, and it soon became evident that these represented a major body of work – highly important for its systematic presentation and committed tone, not to mention the sheer volume of the material. Indeed, I began to realize that this represented a trove of writings about music in France unrivaled since the time of Hector Berlioz! It was then that I decided to explore this aspect of Florent Schmitt’s life in depth, beginning with his articles published in the newspaper Le Temps – the largest and most cohesive collection – which dated from 1929 to 1939. PLN: Tell us how your research into Schmitt’s work as a writer got started, and how it progressed. At what point did you decide to pursue the idea of collecting and publishing Schmitt’s writings? GLD: Following my analytical coursework, I embarked on further music history studies with Rémy Campos in Paris. In spring 2012, the idea of making my dissertation topic on Florent Schmitt’s music criticism came to my mind. To better frame the subject, I restricted myself to Schmitt’s articles published in Le Temps. It was also at that time that the notion of publishing all 187 of these articles was born. An initial approach to Editions Vrin was encouraging, but then the major work has to begin. After all, this endeavor is far more than simply reprinting Schmitt’s writings, but also providing the proper historical and musical context. It is a major undertaking, and the time required is difficult to find due to my various activities. This has caused the project to go a little dormant from time to time. PLN: What general observations can you make about Schmitt’s writing? How did he approach the preparation of his concert reviews and other articles? Florent Schmitt, photographed during his later years as a music critic. GLD: This question is best answered by recounting how Schmitt worked with Le Temps. 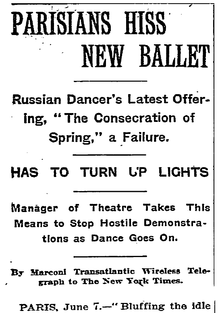 He prepared and delivered a column every two weeks in which he gave his impressions of the latest concerts. His six-column articles, occupying the bottom of Page 3 in every Saturday newspaper edition, stand head-and-shoulders above the writings of other music critics – not just in their clearly polemical tone, but also in the desire to showcase new and unpublished works – thereby encouraging new music. In effect, the entire world of Parisian concert music in the 1930s is encompassed in these articles by Florent Schmitt. 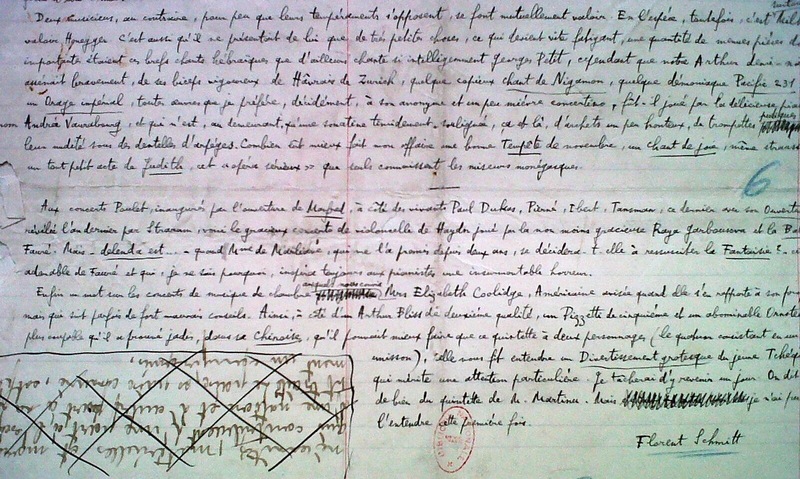 We see from Schmitt’s own manuscripts [housed at the Bibliothèque National in Paris] that Schmitt was a natural writer. Entire pages of his drafts are free from erasures, with long segments that bear no trace at all of adjustments. On some pages, “summary” or “verdict” sentences that are noted in the margins are then reintroduced into the article. A page from one of Florent Schmitt’s articles on music published in Le Temps. The manuscripts exhibit the composer’s characteristically meticulous penmanship. There are also cases where Schmitt re-used analyses published at an earlier time, such as a literary and artistic review of Paul Prévost which Schmitt had originally published ten years earlier in the Revue de France. PLN: It is commonly believed that Schmitt was very definitive in his opinions, and expressed them not only in his writings but also at the performance venues as well. There are even claims that he would sometimes forcefully declare his “verdict” on the music from his seat in the concert hall. Based on your research, is this characterization correct, or is it an exaggeration? GLD: I would say that Schmitt made criticism a weapon to defend his opinions and to attack what he saw as the “dilettantism” of a Parisian public that was often chilly and conservative when it came to music. To make his point, often he would use both imaginative language and sardonic humor – and even biting irony at times. In Schmitt’s writings, we read extensive descriptive passages — but which suddenly give way to puns or pithy language deliberately meant to shock. It is indisputable that this kind of behavior sometimes ended badly – and in this regard a 1933 concert devoted to Kurt Weill’s compositions weighs more than ever on the composer, where Schmitt shouted ‘Vive Hitler’ to emphasize his disapproval of the quality of the musical content being presented. This incident would prove to be too easy to conflate to allegations of a collaborationist attitude [with Vichy France] later on — notwithstanding other factors such as Schmitt’s son being held prisoner in Germany during World War II. PLN: For how long a period did Schmitt work as a critic, and how extensive are the writings that have been preserved? 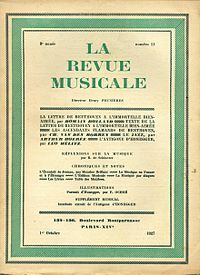 La Revue Musicale, the premiere music-centric French periodical from the 1910s to the 1930s. 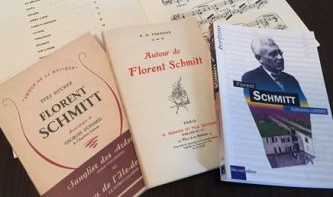 GLD: Florent Schmitt’s years as a music critic extended nearly 30 years, with his articles published primarily in four press organs – first in France Musicale from 1912 to 1918 and then the Courrier Musical from 1917 to 1928. From there, he moved to Revue Musicale where he wrote articles in a section of the publication called “The Arts and Life” between the years of 1922 and 1931. Lastly was Le Temps, where from 1929 to 1939 he wrote in the mode of a serial-chronicle about important Parisian concerts and the new compositions being presented. Beyond this, there are some isolated articles, some material published in the Guide du Concert, as well as a number of radio interviews which still await transcription. What’s particularly fascinating is that Florent Schmitt did not content himself with merely writing and submitting these articles to the papers; he also organized and categorized what he wrote. This is particularly true in the case of the articles published in Le Temps. Thc cover of one of the notebooks containing Florent Schmitt’s original dispatches to the newspaper Le Temps covering musical events in Paris. The notebooks are archived at the Bibliothèque National de France. 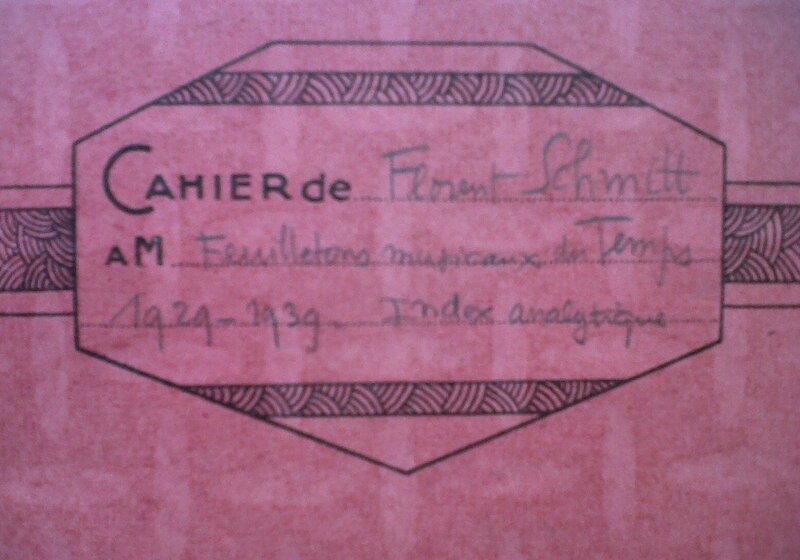 In two notebooks that are held in the archives of the Bibliothèque National de France, Schmitt collected those 187 articles, arranged them chronologically, and established an index of the composers cited. 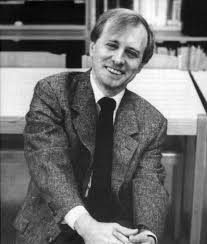 The articles were reviewed by Schmitt, corrected or amended, as well as adding marginalia – all of which shows the importance that Schmitt assigned to his writings. PLN: I’ve read somewhere that Schmitt was critical of Ravel’s Boléro, characterizing the piece as “a unique error in the career of the artist least subject to error.” Based on your review of Schmitt’s writings, are there one or two similar items that stand out in your mind as particularly intriguing in this regard? “Oratorio pornographique”: Jules Massenet’s Marie-Magdeleine. Clearly, Schmitt was ill-disposed to encountering only “commonplace” works on a concert program — Beethoven’s Fifth Symphony, Franck’s Symphony, selected orchestral pieces by Wagner and so on. Concerts featuring Tchaikovsky, Saint-Saëns or Brahms repertoire he labeled “solennités rituelles” (solemn rituals) for their lack of invention, with no contemporary creations being performed. On the other hand, Schmitt greatly admired the Russians (Borodin, Balakirev, Mussorgsky, Rimsky) whose orchestral mastery he loved, as well as the French harmonies that composers such as Chabrier, Debussy, Fauré and Ravel exploited. 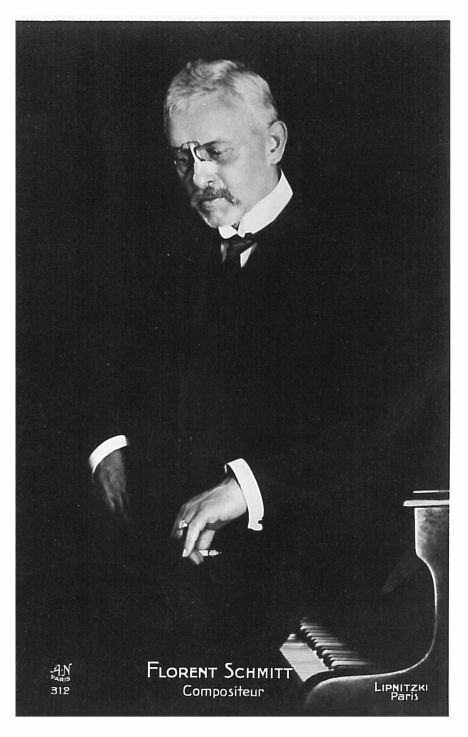 Moreover, Schmitt lavished great attention on contemporary music in his writings while promoting and defending the younger generation of composers. Among them were Honegger, Delvincourt, Rivier, Loucheur and Mitropoulos, along with his own pupil Pierre-Octave Ferroud. Lastly, among his own contemporaries, Stravinsky was one of his favorites – even while he expressed some reservations about the neo-classical turn the composer made in the 1920s. Despite this, in a radio interview with Bernard Gavoty in 1956, Schmitt returned to his unabashed enthusiasm for Stravinsky. 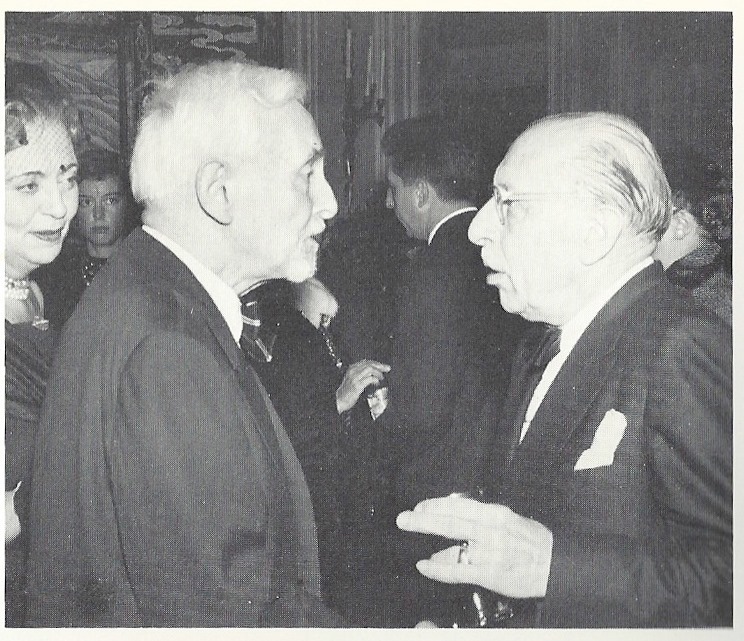 Composer Florent Schmitt (age 87) with Igor Stravinsky (age 75) and Vera de Bosset Sudeikin Stravinsky at a social gathering at the American Embassy in Paris (1957). Fellow-composer Henri Dutilleux is between both men (back to camera). PLN: Why do you feel that publishing the collected works of Florent Schmitt’s music criticism is an important endeavor? What is it about these writings that you consider particularly noteworthy – or possibly unique – in the world of Parisian or French music? GLD: While the writings of Florent Schmitt have been the subject of periodic attention here and there, they have never been collected and studied in a comprehensive way. There has never been a concerted effort to delve into the rich subject matter addressed by Schmitt in his writings about the music of the times – denouncing the “fumisterie” and encouraging the younger generation of artists he considered most capable. In this regard, Florent Schmitt is unique: The composer-critic poses as an arbiter of taste and lays the foundations for an aesthetic of “contemporary” music. Sometimes highly technical, Schmitt’s writings are noteworthy in the detail of the information presented and the opinions stated — as well as in the concise observations made about compositions, orchestration and other factors. Taken as a whole, this body of work is a true testament to musical life in France, and is absolutely without equivalent in the interwar period. PLN: Please tell us about your personal and professional background. Is it really true that you are a composer, a teacher and a researcher as well as a performer? GLD: Yes, all of those. In addition to my scholarly work, from 2011 to 2015 I taught organ and musicology first near Rennes and then in Sainte-Anne d’Auray in Brittany. Today, I am organist at Rennes Cathedral in addition to teaching music analysis at the conservatory in that city. I continue my research activities and composing as time permits, participating in concerts, conferences, courses and master classes. All of this takes time and patience, but as people say, “Art is long …”! PLN: What are the future plans for the Florent Schmitt project? Are there other noteworthy activities and projects you are working on at the moment as well? GLD: The mission of the Schmitt project is simple: to finish the annotations in order to be able to present to a publisher what would comprise two large volumes of material. But other projects are also in progress, too, including an organ method book (nearly completed), a synthesis of religious music in France during the 19th century, as well as completion of Atelier de l’artiste, a book devoted to musician workshop methods of all kinds. There are several other projects in the works as well, including a theory of harmony plus some essays on music. As for my own musical compositions, the completion of a Requiem is being slowed down by all of this mass of other work! While we certainly understand and appreciate Guillaume Le Dréau’s time constraints, we can only hope that the Florent Schmitt project will take precedence over some of his other obligations so that the composer’s insightful writings can be published for the benefit of a new generation of readers. This entry was posted in Classical Music, Composers, French Composers, Organ Music and tagged Alain Louvier, Courrier Musical, Florent Schmitt, France Musicale, French Composers, French Music, Guillaume le Dreau, Le Temps, Marche Nuptiale, Music Criticism, Nicolas Slonimsky, Paris Conservatoire, Remy Campos, Rennes Cathedral, Revue Musicale, Schmitt, Virgil Thomson. Bookmark the permalink. « Fête de la lumière: Florent Schmitt’s extravagant showpiece at the Paris Exposition (1937). This is a terrific and illuminating article about the literary career of Florent Schmitt. I, too, was seduced into a project of publishing the collected writings and letters of Schmitt in the 1980s, but my dissertation on the compositional style of the composer based on Psalm 47, The Tragedy of Salome and other early works took up all my time. I am thrilled by the prospect of this project and believe it to be of paramount importance in the history of French music in the first half of the 20th century. Thank you for bringing this to light.